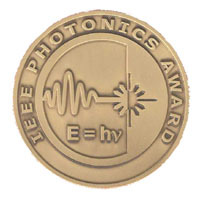 The IEEE Photonics Award was established in 2002. Photonics is defined as the science and technology of generating and harnessing light and other forms of radiant energy whose quantum unit is the photon. It is awarded for, but not limited to: light-generation, transmission, deflection, amplification and detection and the optical/electro-optical componentry and instrumentation used to accomplish these functions. Also included are storage technologies utilizing photonics to read or write data and optical display technologies. It also extends from energy generation/propagation, communications, information processing, storage and display, biomedical and medical uses of light and measurement applications. This page was last edited on 25 March 2019, at 19:52.